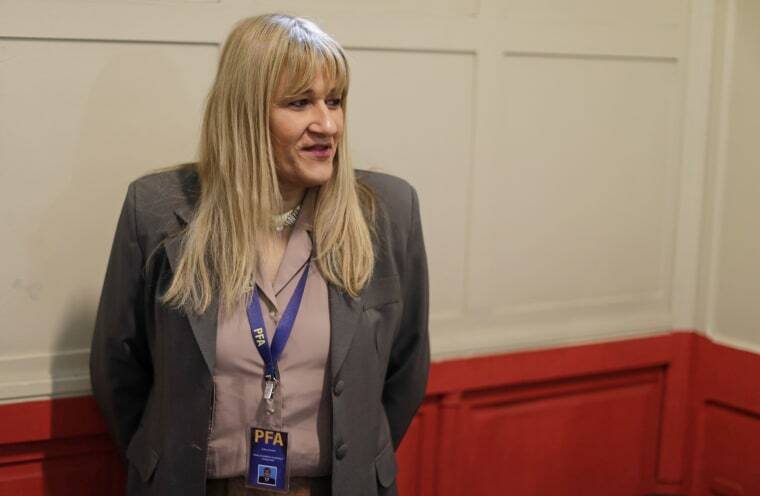 Analia Pasantino served in Argentina's federal police as a man for 20 years, then she came out as a transgender woman and was forced to resign. She is smiling these days, though, beaming with pride to be wearing a police badge again. And the sign on the door to her office reads: "Chief." Nearly a decade after psychiatric reports said Pasantino suffered from an "irreconcilable" illness that made her unfit to serve, she was welcomed back to the police force this week and appointed deputy police commissioner in the judicial communications department. "This is a milestone," Pasantino, 49, told The Associated Press on Thursday. "I'm the first transgender police chief in Latin America. It's an unprecedented and important step to show Latin America and the world that we are an open institution." "The world has changed," Pasantino said. "You can live a life of gender identity and it's no longer necessary to live a double life." When Pasantino began dressing in skirts and high heels, the couple went out at night through the garage door to avoid being spotted by the neighbors. They would drive around Buenos Aires, but Pasantino at first lacked the courage to get out of the car. "The decisive moment came when my wife finally told me: 'Either you step out or you'll never leave the house looking like this again. I've put up with you for three hours getting ready and putting on makeup.'" Together, they fought against bureaucracy that initially blocked them from changing Pasantino's male name on their marriage certificate and obtaining their law degrees. Pasantino, who has shoulder-length blonde hair, still wears the same engagement ring that she first wore as a man long ago. "She has backed me with everything," Pasantino said about Mauro, who is also a lawyer. "She has been my pillar of support." "It was always seen as illness," she said. "As crude as it sounds, the final diagnosis was: a disturbance in gender identity that made me unrecoverable to the police force." She also credits the efforts of Mara Perez, a transgender woman who leads the diversity division at Argentina's security ministry. "Mara's efforts were priceless," Pasantino said. "When they said 'no' under previous governments, she kept insisting until she succeeded." This week, Pasantino was flooded by messages of support from former colleagues and requests for interviews after she was welcomed back into the police force at a televised press conference with Argentina's security minister and the federal police chief. "At first I was a bit overwhelmed by so much attention. But I'm proud to tell this story," she said. "And I hope it helps others as well."